Spring 2009 saw the release of the second in series of four one cent coins by the United States Mint meant to celebrate the bicentennial of Abraham Lincoln's birth in 1809. The 2009 Lincoln Cent Formative Years coin was created as part of the Presidential $1 Coin Act of 2005 (Public Law 109-145). 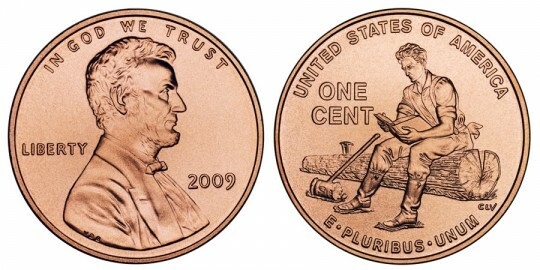 This version of the Lincoln cent follows the 2009 Lincoln Cent Birthplace coin which was released on February 12, 2009. The Birthplace coin marked the first time the cent has been changed in 50 years. In 1959, an image of the Lincoln Memorial in Washington D.C. was featured on the reverse and it remained that way until now. The first Lincoln cent was issued in 1909 to celebrate the centennial of Abraham Lincoln's birth and featured the words "ONE CENT" and "UNITED STATES OF AMERICA" flanked by two sheaves of wheat. This is commonly known as the "wheat penny". Born in Kentucky, Abraham and his family moved to Indiana where he grew up learning a good work ethic and had a love for reading and learning. This is depicted on the reverse of the Formative Years coin. It shows Abraham taking a break from rail splitting and reading a book. Abraham would go on to hold several jobs as well as political posts, and would finally become the 16th President of the United States. He died in the service of his country when he was assassinated a few days after the end of the Civil War. Also of interest may be the Lincoln Silver Dollar Proof or Lincoln Silver Dollar Uncirculated coins, which were released as well in 2009 to celebrate the bicentennial. For information on the coin designed to follow the four 2009 Lincoln Cents, see the 2010 Lincoln Cent. A young Abraham Lincoln is featured on the reverse. It shows him reading a book while taking a break from rail splitting in Indiana. It is meant to signify the interest Abraham had in reading and learning, while still not afraid of hard work. "UNITED STATES OF AMERICA", "E PLURIBUS UNUM" and "ONE CENT" are also found on the reverse. It was designed and sculpted by Charles Vickers.